Safety is of the utmost importance. 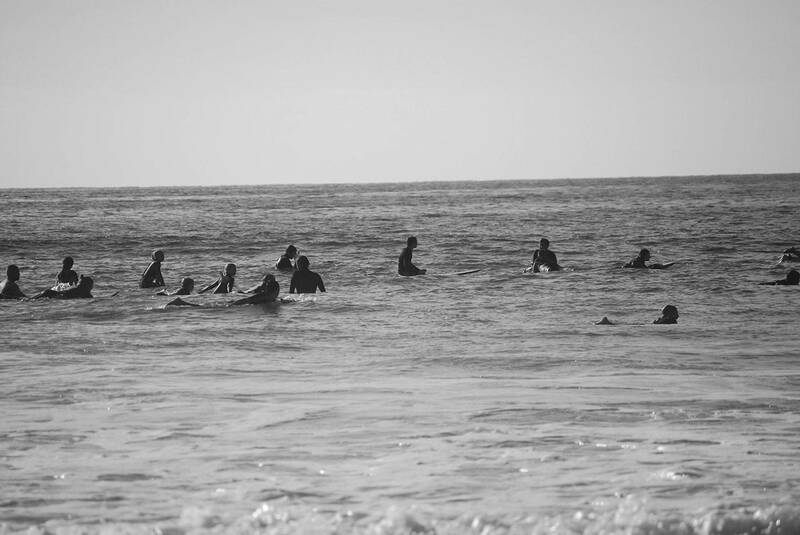 During a typical practice, we will have approximately 40 surfers in the water. Knowing the following rules will help you, our fellow team members, and the "locals" stay out of harm's way. Additionally, please keep in mind that we will be "taking over" the practice location and we don't want to wear out our welcome with the local surfers. 1. Right of way/ wave priority- The person closest to the breaking part of the wave has the right of way. If you do not have the right of way (priority) please do not take off on your fellow surfer as this increases the chance of a serious accident. Remember, you are responsible for any injuries or damage you cause to another surfer or board. Looking at the image below, determine who has priority. 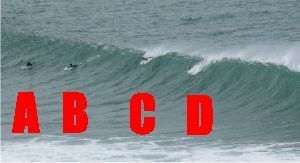 Surfer A,B,C, or D ? Ok, so the answer is D. Surfer D is closest to the breaking part of the wave. Surfers A, B, and C are on the "shoulder" of the wave. If surfers, A, B, or C drop in on surfer D, they are "snaking" the person with the right of way. Snaking is not cool and can be very dangerous. If the coaches notice you snaking other surfers, you may be asked to to exit the water for the remainder of practice and/or miss the next practice. 2. Always study the surf conditions before you paddle out. If the conditions are beyond your abilities, stay in waist deep water, or surf another day. 3 Do not to bail/ abandon your board when a wave breaks in front of you, especially if there is someone close by, or behind you! Learn to hang on to your board ! Learn to turtle roll or hang on to the nose of your board. If you don't know how to do either method, ask the coach to show you how. 4. Always surf with a buddy or with a group of friends. 5. Do not leave the practice area. 6 Whenever possible, paddle around the lineup, not through it. 7. Beginners should stay off to the side of the main peak (usually where the crowd is) and only attempt to catch waves that pass through un-ridden. You should not be in the take off zone unless you are capable of controlled take offs in a main peak situation. 8. If a collision looks imminent, paddlers should "keep their line" and let the rider be the one to take evasive action. 9. Try your best not to be a wave hog- wait your turn... especially if you ride a long board and can catch waves easily. Learn to give and you will receive. 10. If you inadvertently snake/ drop in on someone, immediately and safely exit the wave. A friendly apology goes a long way. 11. Give a yell- If it looks like someone is going to snake/ drop in on you, let them know you have the right of way by calling out with a "got it", "mine", or "going right/ left". This will help clarify the situation. In this example, the surfer closest to the peak (breaking part of the wave) has priority and should call out with a friendly "got it" or "going right". In this example, the surfer furthest from the peak has "snaked" the surfer with priority. Don't be a snake!!! 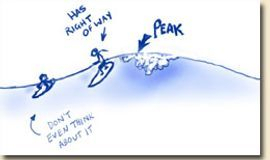 Splitting the peak is okay, and occurs when the wave allows for one surfer to right and the other to go left. 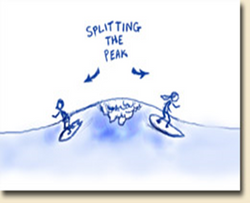 Usually, both surfers will agree to split the peak before they have caught the wave (i.e. "I'll go right if you go left").